Cut 20cm of the 0.7mm black wire and wrap it 4x around a 4mm thick steel stick. Turn both wire ends around each other crossing over the wraps. Remove the stick. Bend one wire end through the wrapped loop as shown in the illustration and repeat with the other end of the wire. Press the outside of the wrapped wire with the flat-nose pliers. The wire ends will cross during the process. Bend both wire ends parallel again using the flat-nose pliers as shown in Illustration 3. 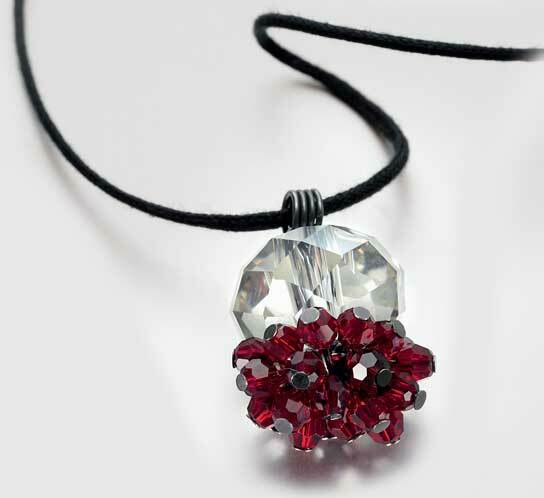 Slide the CRYSTALLIZED™ bead article 5041 onto both wire ends. Bend the two wire ends coming out of the crystal into loops using the round-nose pliers as shown. Loops should be approximately 3mm. Wrap the wire ends around the middle axis while holding the two loops with the flat-nose pliers, first one end, then the other. Cut off the ends with the wire cutter. Use flat-nose pliers to press cut off ends near to axis. Push wrapped part inside the bead with the tip of the tweezers (see illustration). Grip both sides of a jumpring with flat-nose pliers and open the jumpring sideways. Insert it through both loops and close the jumpring. String one CRYSTALLIZED™ bead article 5000 on a headpin and form a loop as shown in the illustration. To create the loop use the round-nose pliers and cut off the remaining wire with a side-cutter. Repeat to make 26 pendants. 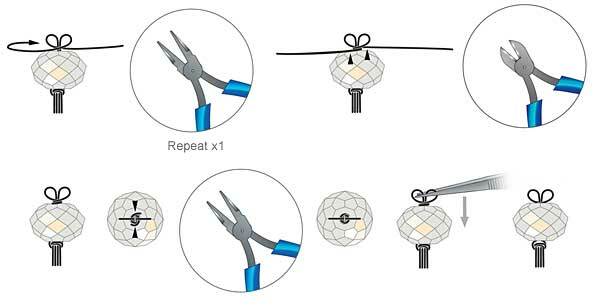 Open the headpin-loops of the pendants made in Step 7 sideways with a flat-nose pliers and insert them into the jumpring of the element created in Steps 1–6. Close the headpin-loops. There will be 7 pendants on either side of the loops as shown in the illustration. Attach 6 more pendants onto either of the two loops in the same way as described in Step 8. You may wish to use tweezers to slip in the open headpin-ends into the loops when it starts to become crowded. Cut 100cm of the 2mm black leather cord with scissors. Slide it through the wrapped loop of the pendant.